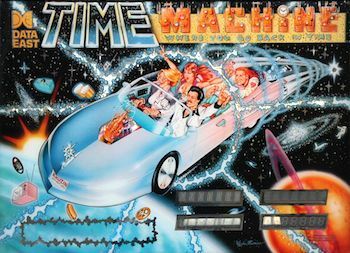 Time Machine is an early Physical Pinball Table from Data East. Released in 1988, It was designed by Ed Cebula and Joe Kaminkow, with music by David Thiel and art by Kevin O'Connor and Margaret Hudson. The game's premise is a simple one: fire up your time-travelling sports car for an interdimensional tour. Shoot the ramps and rollovers to spell STARWARP, then hit the center ramp transporter and beam yourself across the playfield for a million points. Travel from The '80s back to The '70s, The '60s, and The '50s, locking a pinball in each era, then unleash them for a three-ball multiball and a shot at the Jackpot. For more nostalgia, go to The '50s and the table turns into an old-fashioned electro-mechanical pinball, complete with old-school chimebox sound effects. Time Machine is fondly remembered for its blend of fast action, player-friendly design, and nostalgic fun — it does not have the deepest ruleset, but allows anyone to have a satisfying game without needing to be an expert. The Jive Turkey callouts for each era add to the fun, and the 1950s chimebox is an audio bonus for longtime players. Badass Bureaucrat: The time machine passenger from The '80s is a female executive wearing a pin-striped power suit and no-nonsense glasses. The Cameo: A small Pac-Man can be seen on the playfield, representing The '80s. Cool Car: The time machine morphs from a pink Cadillac to a silver Corvette convertible that travels through time and space. Creator Cameo: Artist Margaret Hudson is the hippie in the time machine. Disco: A disco dancer is used to represent The '70s. Excuse Plot: Ultimately, the time-travel premise is just a way to justify the game's electro-mechanical chimebox. Expository Theme Tune: Played during the end-of-game karaoke mode. "Time Machine, where you go back in time..."
Fish out of Temporal Water: The passengers traveling through time in the Time Machine include a disco dancer, a Granola Girl hippie, and a fifties football star. Genre Throwback: When the player reaches The '50s, the alphanumeric display simulates the scoring reels of an electro-mechanical pinball while the game plays analog sounds from its chimebox. Granola Girl: The female time machine passenger representing The '60s. Hollywood Costuming: The four passengers are dressed in iconic outfits for their respective decades. "Dedicated to the memory of Sam Stern and Harry Williams. Friends, founders, and fathers." Jive Turkey: Each era is represented by an assortment of period slang, such as "Far out", "Gag me with a spoon," "Hang ten! ", and "Make love, not war." Nothing but Hits: The television sets representing The '50s are showing The Bozo the Clown Show, The Howdy Doody Show, and Elvis Presley. Our Time Machine Is Different: Not only does it morph, it also flies through space. Outside Ride: The fifties football star is left hanging off the back seat of the Time Machine car. Popular History: Used throughout the game to represent the various eras, such as the Granola Girl and peace sign for The '60s. The Present Day: The game begins in 1989, pretty much the present day considering the game was released in December 1988 (and produced through April 1989). Spelling Bonus: Spell S-T-A-R-W-A-R-P to light the million-point center spiral jackpot. Time Machine: A morphing car, in this case. Time Travel: The theme, dur. Vanity License Plate: The time machine's plates read KRUZIN.